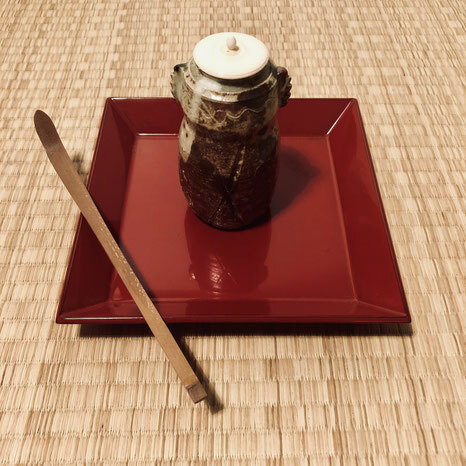 This month's section of Oribe's 100 Lines of Chanoyu deals mainly with using a chaire on a display tray, commonly called a 'shihōbon' (square tray) by tea practitioners. Using a shihōbon for a chaire in contemporary practice represents a fairly advanced level of practice. Oribe seemed to really enjoy using the shiōbon. He liked to pair a large shihōbon with a small-ish chaire - the aesthetic of contrasts as he so enjoyed. Nowadays it is only on rare occasion that we would use a 'guri' or carved lacquer tray as they are a pretty serious luxury item. The majority of trays are plain lacquer with no wood grain showing. When using a carved lacquer tray, placing a chashaku on the floor of the tray risks getting tea powder in the carved motif. When using a high ranked chaire, doing something as careless as this doesn't match the temae. The practical advice around this is to place the chashaku across the front corner (so that the scooping tip of the chashaku is suspended in the air and no matcha touches any surface). When using a plain lacquer tray, the advice is to either place the chashaku on the floor of the tray or across the front corner. Over time, in the Ueda Ryū it has become a rule to place the chashaku across the front corner in all cases when the chashaku has residual matcha powder on it. When resting the chashaku on a tray with a lacquer motif carved in relief, rest the chashaku across the left corner of the tray. Rest the chashaku on the front left (side) for a plain (lacquered) tray. The chashaku can also rest (across) the edge of a plain tray. When wiping the chaire and placing it on the tray, support the chaire with your left hand. Perform the temae in this way. This suggests that the host purifies the chaire, then places the fukusa into their kaichū (front pocket of the kimono) in order to hold the chaire with the right hand. As the supporting hand is the left hand, the right hand must have a firm grip around the chaire. This can only be done by dealing with the fukusa somehow. As the chaire wold not be placed down on the tatami in order to place the fukusa back in the obi, we can infer the fukusa is either placed in the kaichū or on the tatami. In the Enshū Ryū, another school whose founder was a student of Oribe's, the fukusa is still placed in the kaichū for situations such as this. We can therefore assume that we are seeing the formalisation of this part of the temae.